More a back alley than a grand boulevard, Lexington Avenue has a surprising number of very important buildings but its narrow sidewalks, steep cliffs and congestion make it less than attractive. Some buildings, in fact, were embarrassed to front on the avenue. When Olympia & York gutted and rebuilt 466 Lexington Avenue at 46th Street, for example, the new building was named Park Avenue Atrium, (which happens to have one of the most spectacular atriums in the city). Its roster of great, older architecturally prestigious buildings is considerable: the Chrysler, Chanin, 570 Lexington Avenue (the former General Electric Building built in 1931 and designed by Cross & Cross, see The City Review article), the New York Marriott Marquis (the former Halloran House and originally the Shelton Hotel), the Lexington Hotel, and, of course, the back of the Waldorf-Astoria Hotel (see The City Review article). Its renaissance began with the completion of Citicorp Center (see The City Review article), shown at the rear in picture at the right, in 1977. Citibank then had its headquarters across the avenue at 399 Park Avenue, a full-block building. Its decision to expand on Lexington Avenue and, more importantly, to erect a daring and innovative and very modern skyscraper instantly upgraded the avenue and unleashed a rash of new development, most notably Edward Larrabee Barnes's angled blue-green tower for Boston Properties just to the south of Citicorp Center, the tower just in front of Citicorp Center in the picture at the right, Manhattan Plaza, directly across from Citicorp Center, and Helmut Jahn's International Plaza at 59th Street and his "squashed" tower at 425 Lexington (see The City Review article) just to the north of the Chrysler Building and Donald Trump's reconstruction of the former Commodore Hotel into the New York Grand Hyatt Hotel across from the Chrysler Building. In addition to the above-mentioned reconstruction of 466 Lexington Avenue, Hines Interests and Sterling Equities developed a new office tower over the Grand Central Station post office. Caught up in the spirit, the owners of the formerly gold-colored Grolier Building attractively reclad it in dark glass in a pleasant design by Der Scutt. As a result, unfortunately, the avenue lost much of its fairly consistent masonry context and got an eclectic bunch of shiny towers of very uneven quality. 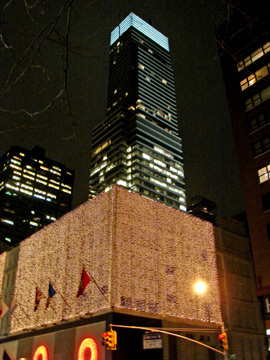 Jahn's two buildings share an oddly colored bluish palette with Barnes's 599 Lexington Avenue. Trump's Hyatt Hotel and the pinkish polished granite facade of Park Avenue Atrium are rather atrocious and look bad in comparison even with Morris Lapidus's sinuous, Miami-style New York Loew's Hotel (formerly the Summit Hotel). The only four decent new buildings since Citicorp Center are the above-mentioned, black reflective glass Manhattan Plaza, the Hines Tower and 560 Lexington Avenue, a very respectful, contextual, red-brick, medium-size office building erected by Rudin Management with a quite extraordinary, though awkward arcade that incorporates an enlarged subway entrance and a swirl of brick designs, and Madison Equities's concave 1987 office tower designed by Kohn Pederson Fox with free-standing circular tempietto in its large plaza at 137 East 57th Street. Jahn's buildings, it should be noted, are very unusual and interesting and International Plaza, developed by Cohen Brothers Realty & Construction, across from Bloomingdale's, not only widened the sidewalk significantly but also created a very impressive retail base and a particularly appealing crown reminiscent of conical Sumerian hats. International Plaza certainly puts Bloomingdale's to shame and would be an excellent building if its very unattractive entrance loggia/canopy on 59th Street were removed or redone. Of the truly great buildings, the Chrysler (see The City Review article), shown at the left, 570 Lexington Avenue and the Chanin, only the latter has a good base. The bas-reliefs around the Chanin base are, in fact, marvelous. The great bases belong to the New York Marriott Marquis and the Lexington hotels, both richly ornamented with many figures and gargoyles. The massing of both buildings, however, is bulky and ungainly, although the latter was highly influential because it was one of the first major buildings to be erected according to the 1916 Zoning Ordinance and was depicted by some important artists. The Beverly Hotel, designed by Emery Roth & Sons, is far more attractive in its silhouette, although it is otherwise rather prosaic. Despite the general consensus at the time of its construction that sunken plazas were unworkable in midtown, Citicorp Center has one that further accentuates its tower being raised on stilts, accommodates a subway entrance and a large waterfall, and entrances to the bottom level of the project's atrium. Hugh Stubbins's design for Citicorp Center was innovative in many ways, such as narrow angled windows along the sidewalks to look in on the atrium shops, but is most noted for its silvery facade and rakishly angled, sheared top. In 1997, Citicorp Center "jazzed" up its retail frontage, an unnecessary but not disastrous "updating." Barnes's triangular plaza at 599 Lexington Avenue (see The City Review article) pays great homage to Stubbins's building, as does his sheared tower form. The plaza is particularly attractive because of its large, sculptural, angled skylight for its subway entrance, which is surrounded by benches. This tower is fine, except for its pallid color. The avenue has long been beset by cheap stores and food shops that mitigate against its upgrading. At the very least, Citicorp's superb sidewalk pylons that incorporate traffic lights, streetlights, trash receptacles and signage should be adopted for all of Lexington Avenue in midtown. Given the fact that Park Avenue offers the glamour of a wide landscaped boulevard one block away, it is not necessary that Lexington Avenue have too large an identity crisis. The city should ban all private automobiles from the avenue from 59th Street to 42nd Street and broaden its sidewalks, install the pylons and encourage lots of banners.